1Department of Diagnostic Radiology, Changi General Hospital and 2Singapore Health Services, Singapore. What are the radiographical findings? There are three small bones seen in the region of the head of the metatarsal of the right big toe. Two are located medially and one laterally. The two small medial bones lie close to each other but are clearly separated from one another. They are both well-corticated. Both medial bones have well-defined margins, with the apposing surface of the distal sesamoid bone having a rounded margin and that of the proximal sesamoid bone having a slightly irregular margin (Fig. 1a, b). No obvious fracture is seen. Bipartite medial sesamoid. These are the sesamoid bones of the big toe and are a normal variant. Normally, there is one medial (tibial) and one lateral (fibular) sesamoid. However, in this case, there is a bipartite medial sesamoid and a single lateral sesamoid. A bipartite sesamoid may be confused with a fracture in the sesamoid bone itself. It is therefore important to know the difference between the two entities, as a bipartite sesamoid is a normal variant. In the big toe, sesamoid bones are seed-shaped bones that are found at the first metatarsal head. They are plantarly located within the tendon of the flexor hallucis brevis.1,2 There are usually two bones, one medial (tibial sesamoid) and one lateral (fibular sesamoid). They play an important role in the mechanics of the foot: increasing the mechanical advantage of the flexor hallucis brevis, assisting with weight-bearing under the big toe metatarsal, and they also help in elevating the metatarsal head off the ground.1,2 The medial sesamoid is usually larger than the lateral sesamoid, and plays a more important role in weight-bearing. What is a bipartite sesamoid? When a sesamoid develops from two ossification centres that do not fuse at maturity, it is referred to as a bipartite sesamoid. About 10% of people have this condition and in those who have it, there is a 25% chance of being bilateral.3 This condition is much more common in the medial sesamoid than the lateral sesamoid. Sometimes there may be more than two centres of ossification. The sesamoid is then called a multipartite sesamoid. How can a bipartite sesamoid be differentiated from a fracture of the sesamoid? What are the other conditions which may cause sesamoid pain? 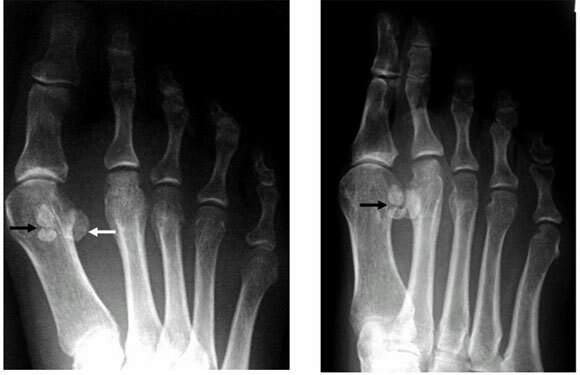 Figure 1 - (a) Antero-posterior and (b) oblique radiographs of the right forefoot show two small sesamoid bones (bipartite sesamoid) located medially at the metatarsal head of the big toe, and one sesamoid located at the lateral aspect (white arrow). Note the sharp demarcation between the well-defined cortical surfaces of the bipartite medial sesamoids (black arrow). These are features of a normal variant rather than a fracture.